The house is accessible by car, Uber, taxi, bus, or bicycling. 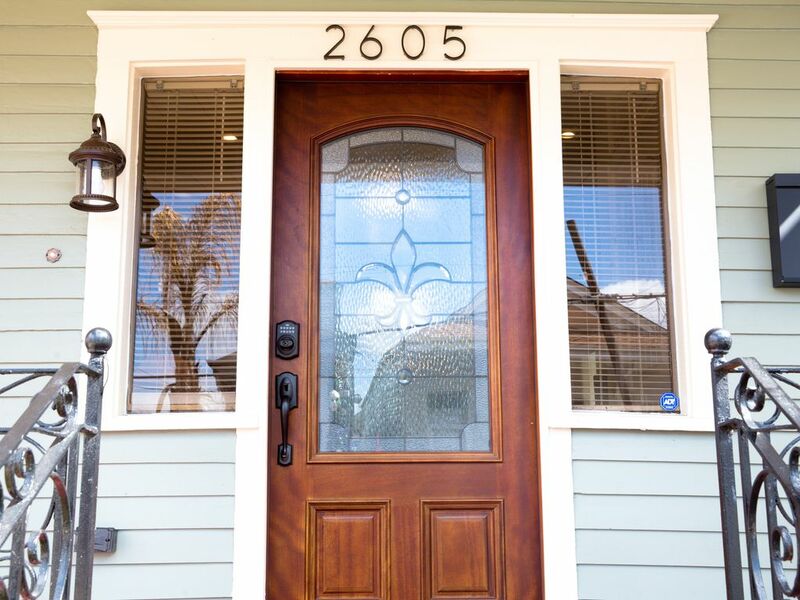 We are centrally located and are 2.7 miles from the French Quarters and downtown New Orleans. Come down and experience The Big Easy and relax in this gorgeous newly renovated spacious abode. Bathroom 2 and 3 are equipped with a toilet tub/shower, fans, and vanity. I provide towels for each guest. I have provided basic seasonings, spices and condiments. Set of dishes, set of silverware, drinking glasses, set of pots, and cooking utensils. Combined, Living room, Dining and Kitchen. This Gorgeous Victorian is surrounded with a security gate and a security system. I will have updated pictures that will display the security gate, security doors and landscaping. We had a fabulous time in NOLA! Our accommodations were roomy, newly upgrade and well stocked with everything we needed. The home also has updated security Alarm system that added to our comfort. Andrea was accommodating to our special requests and wonderful to work with. Thank you for having us in your beautiful home. We promise to be back next year! At first glance the area didnt make a great first impression. The other houses in the neighborhood looked kind of run down or boarded up and empty, but we didn’t run into any problems at all. We had a rental car and would drive somewhere close to the streetcar line and ride into the French Quarter. Not a hassle at all. Andrea’s house seemed newly remodeled and was clean, comfortable and secure. Three pairs of adult couples slept comfortably in the three big bedrooms. The 2 1/2 bathrooms were nice for minimizing bathroom overcrowding. The bathrooms were generously stocked with all the soaps/shampoos we needed. The kitchen was nicely set up and had a nice big refrigerator that Andrea had filled with cold bottles of water - a nice touch! There is a small backyard for hanging out, but we didn’t really use it. The only criticism I have is the lack of seating in the tv watching area. There is only a love seat with an ottoman. Other than that there are the dining room chairs. We were out most days until late in the night, but on the mornings we hung out at the house planning the day’s activities it would have been nice to sit together. Overall, we had a nice stay and Andrea was a very nice and gracious host. The home was very nice and owner was very hospitable and helpful. Very close to downtown NOLA and convention center. We had everything we needed, she also left us waters, laundry detergent, umbrellas(which came in handy with a rainy day) and toiletries. I recommend this home owner and home! I enjoy hosting guests. Stephanie and her family were great with corresponding the purpose of their trip, they treated my place like their own, and most importantly, they were such warm people. I hope to have the opportunity to host them again and any host would be lucky to have them! The house we stayed in was very nice. The owner provided most of the things we needed to have a nice stay. and would gladly host them again. The house was very nice and spacious. Ms Andrea was also accommodating and helpful with some minor issues we had. Location was close to everywhere we needed to be; about 5 minutes from the Superdome, about 10 minutes from my alma mater Xavier University, downtown and the French quarters. I would definitely recommend this home and stay again in the future. Brandis and her group were great with corresponding the purpose of their trip, they treated my place like their own, and most importantly, they are such warm people. I hope to have the opportunity to host them again and any host would be lucky to have them! First off let me just say that Andrea is the sweetest and most accommodating. She superseded our expectations on every level. This was a girls trip with 6 of us. The house is super spacious and very clean. There is also a patio area, if you just want to sit outside for a few. From the umbrella's at the door to the tea and coffee in the morning. If you get a stain she even has shout it out to go with the updated washer and dryer area! Going forward not only do I recommend but I couldn't see myself staying anywhere else. We were about 20 minutes from the airport and 10 from Bourbon Street, we just used the Uber service. There were toiletries in each bathroom so if you forget yours no worries. Feel like cooking well she takes the worry out of that as well with pots, cups, plates and utensils. The beds...let's just say pure comfort! She definitely made this trip a great one for us. She gets 5 stars in our book!!! Thank you Andrea!!! Tamar and her group were wonderful guests to host. They were very respectful of my house rules, treated my place like their own and most importantly were warm people. I hope in the future that I have the opportunity to host them again and any host would be lucky to have them.